The most unique pagoda of Lam Dong Province. 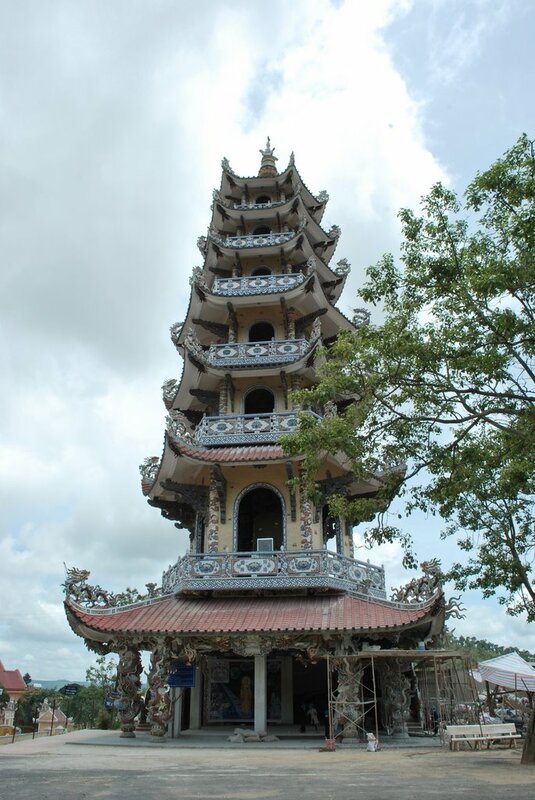 Linh Phuoc Pagoda is funded by the Buddhists and begun to build in 1949 and completed in 1952. Pagoda remained the operations until 1990 and it was restored the whole of it. At that time, the design/ manuscript and of the 5th mastermonk is Thich Tam Vi which make the unique feature for the pagoda, and to be famous until now. To have the complete beauty as in the precent, the masters, clergies and Buddhists of the local and other places contribute to build the pagoda. Set out on the campus of the pagoda, you will be surprised at the astounding site in front of your face. The astists together create the 49 metre long winding mosaic dragon standing near the Mitreya Buddha. The whole fins of the dragon are coupled with the debris of the beer’s glasses estimated up to 12.000 bottle beers. 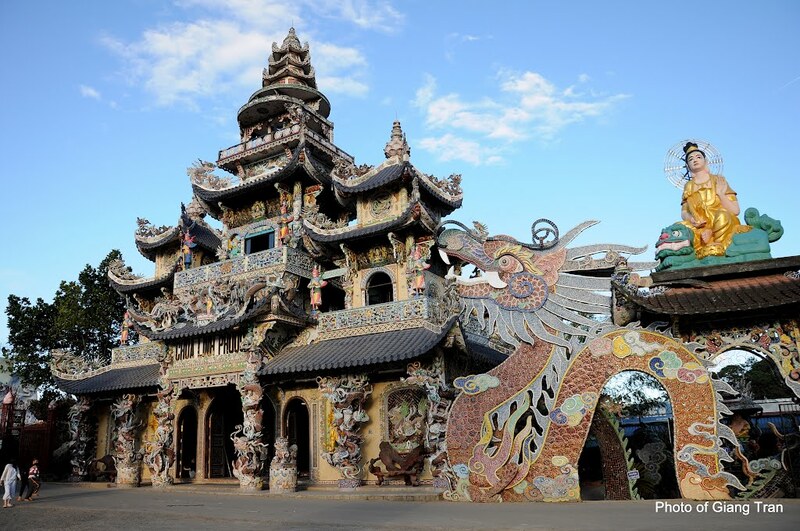 This is one of the most impressive work that attracted a lot of tourists and pilgrims who want to visit and worship at Linh Phuoc Pagoda. Besides, when you enter to the main hall of the pagoda, not only do you thurify but also contemplate the sophisticated sculptures’ patterns which are made by the skillful hands of the artists. The main hall is 33 meters long, 22 meters wide. The front yard of the tower is 27 meters in high inlaid by the dragon-shaped. The first floor of the altar room is 108 feet (unit of ten in Vietnamese), called “ Thien thu thien nhan” ( the heaven hand, the heaven eye). 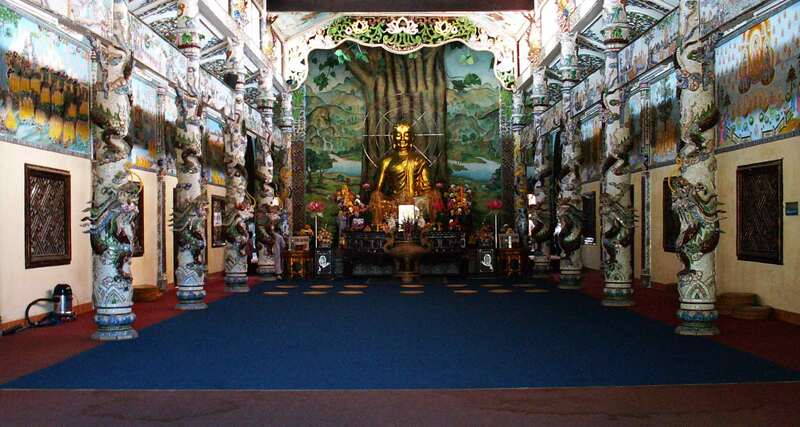 The front of the pogoda, parallel with the main hall is lined with the ornate glass pillars in the shape of flying dragons similar to the architecture of building the tomb of King Nguyen’s Dynasty. Above is the glass reliefs to narrate the lifeo Gautama Buddha (Sakyamuni) from which he was born until he was Nirvana. In front of the main hall, the visitors can witness by their eyes a 7- tiered Tower, 37 meters in height. At present, the bell tower is considered as the highest tower in Vietnam. Inside the tower has a Huge Jar with 4, 3 meter in height, 2,3 meters in diametre, and 8,5 tons in weight which casted by the skilled, high qualified and experienced Hue artisans in 1999. They spent over a year making the mould, cast and carve the images into the bell. Next to the tower is the Lady Buddha statue made by immortal flowers in harmony with the nature and attracted the tourists. On the right side of the pagoda is the interior house. Monks’ house is the activities’ place of the monks. Monks’ house consists of 3-storey house, the upstairs are the Purify room and a semicircular lotus pond. The middle stair and the first floor are the rooms for Buddhists. The middle compartment is the living room and the library. 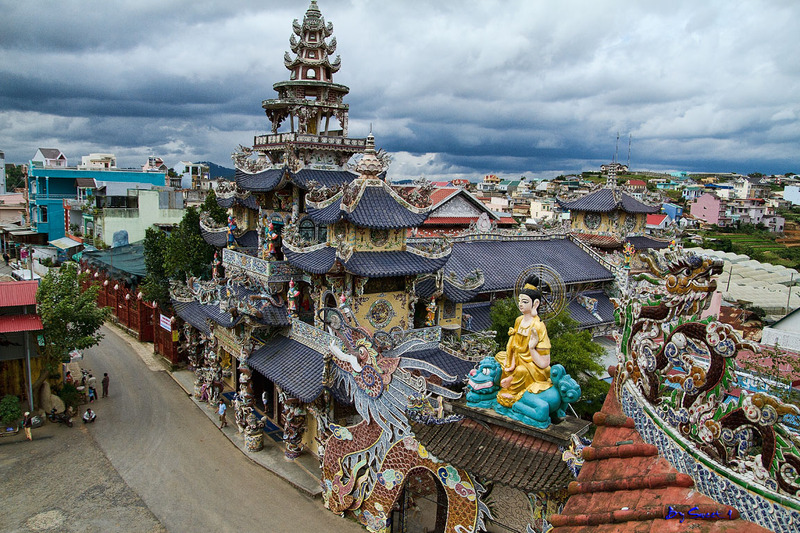 Linh Phuoc Pagoda is one of the most famous pagodas of Dalat City. It is also a sophisticated mosaic architecture and charming character of the southern Asia.